Hand made Raggedy Ann and Andy rag dolls. Their faces are embroidered with yarn, and they have the traditional triangle noses. Their hair is also made from yarn. Raggedy Andy is wearing a checkered shirt and plain green shorts, with two large buttons. Raggedy Ann is wearing a checkered top and bloomers. Both have striped stockings. Johnny Gruelle, who was born in Illinois, wrote the Raggedy Ann stories for his daughter, Marcella, who was sick. He published the first Raggedy Ann story in 1915. Raggedy Andy was introduced in 1920. 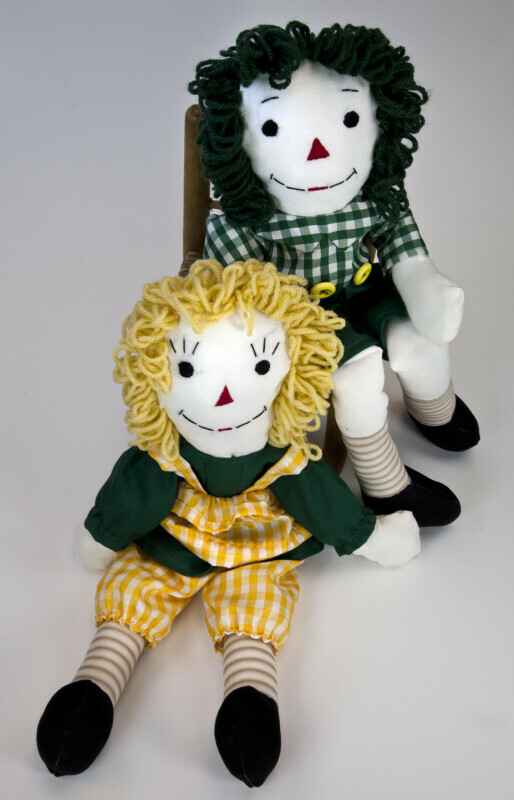 These dolls were hand made by Shelley Stewart at the University of South Florida. The figures are 18 inches (46 cm) tall.